I have several articles about lifespan as well as lowering cancer risk. However, as time passes, new findings and latest medical technologies are surfacing. Therefore, we now have to update these old writings to adapt newer findings. Well, there may be no definite conclusion on how you can extend your lifespan, but we do remember that someone in China have said that garlic can give you excellent health and long life. In Korea, one has said that hot pepper can extend your life. Another one in Egypt said that tea is good. Wise men in Ceylon used to say that coffee can extend your life for 10 years more. Siberians say that long life is because of yogurt. Long-living Okinawans say that it is because of seaweeds and kelps they eat every day. Is it True that the Foods You Eat Can Determine Your Lifespan? Or is it Within God's Will? Yes, the foods you eat play a major role in maintaining your health and away from diseases. Food also acts as a fuel to your brain to control the function of your body and to think about God. We have been researching about lifespan and diseases through the historical records of our ancestors. Yes, it may be true that some foods give good results in extending your life expectancy but some are not. Some may even reduce your lifespan instead. We have some data gathered from Siberia in Russia where the majority of elderly people in several provinces are centenarians. They claim that the secret with their long life is because of yogurt made from sheep milk. Yes, the world-renowned yogurt producer in Japan, Yakult, which was established in 1930, also believes that regular consumption of yogurt contributes to long lifespan. Okinawa is also known and recognized as the land of centenarians in the Guinness Book of World Records. Many are over 100 years old, yet they are active in farmland. They believe that the reason why they are still healthy despite old ages is likely because they consume a lot of kelps. Aside from this, we've learned that there is a small village in Japan where the average population consists of elderly people ranging at age 80 to 110. According to the city administrator, there have been no sick people for the last 50 years. Also, there are several villages around the world whose lifestyle as well as lifespan are similar to that of a Japanese villager. Of course, we are very interested in knowing their secret. We believe that these healthy centenarians have one thing in common—they live in areas where there is an abundance of tea plantations! Why Sipping a Tea Can Make You Healthy and Live Longer? One of the major healthy ingredients of a green tea is “catechin”. Catechin is known as an anti-aging and anti-cancer substance, too. But to achieve full effectiveness of catechin and other substances from green tea, you should eat it in grated or paste form. This will allow you to take full advantage of all the nutrients green tea has to offer. People in these provinces believe that green tea can protect you from all sufferings. In fact, in these towns, there are no hospitals and there are only few clinical facilities provided by the government. Yet in this modern century, no people ever complain. According to them, no one gets sick. Records show that there are no cancer patients for the past decades. For centuries, green tea has also been known to be effective in lowering blood cholesterol. It is evident that in these villages, no one ever suffers from diseases of civilization. Green tea helps prevent obesity, too. Is it the reason that residents of these towns are fit and slim with beautiful skin complexion? For you to believe, try consuming green tea for the first three months, you will be surprised to know and experience the new you. According to the town people, you can observe healthy results in three months time. Prepare any green tea bags available at your nearby supermarket. 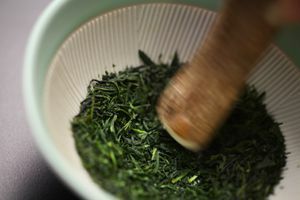 Add a few teaspoons of water on about 3 tea bags of green tea. 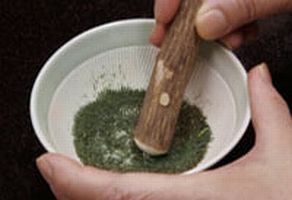 Using a mortar and pestle, grind the green tea leaves to form a paste. If you have time, place it under the sun for about one hour. Otherwise, place it in a microwave oven for two minutes. Now, you are ready to make a tea for drink, or you can use it as a condiment by sprinkling it to your food. At least consume 3 to 5 tea bags a day for three months to have result. Of course, you should continue it for lifetime. You can expect good health and longer life up to 120 years old, hehehe. Oh, yes, I am drinking green tea every day since childhood.